Don't miss your opportunity to be included in Soaring Dimensions 2007. A lot has changed in 25 years in San Diego. Downtown has seen a new convention center, ballpark, office building and high-end flats while the Gaslamp District has gone from a place for x-rated movies to a bustling hospitality hub. Elsewhere, in 1981 there was no Coaster, SR-56 or SR-54 and the development of Otay Mesa was just beginning. 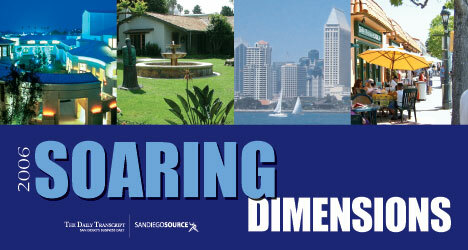 In this section of Soaring Dimensions we look at what has shaped today’s San Diego. Construction and real estate transactions are far from letting up in this region. Central San Diego continues to reshape itself. Read all about it in the 25th annual edition of Soaring Dimensions. Find out the latest real estate and construction developments in East County and beyond in the 25th annual edition of Soaring Dimensions. New construction, redevelopment and real estate transactions are happening at a rapid pace in North County. Find out where and why in the 25th annual edition of Soaring Dimensions. Southeastern San Diego is developing at an amazing pace. Learn about the revitalization efforts under way and why businesses and families are calling this region home. Several projects in South County are set to transform this region into a destination for businesses and new residents within a matter of years. Learn more in the 25th annual edition of Soaring Dimensions. San Diego's neighbor to the north, southwest Riverside, has grown at a remarkable pace over the last few years due to affordable housing, plenty of commercial real estate opportunities and its proximity to Interstate 15. Read all about it in the 25th annual edition of Soaring Dimensions. Whether a case of right place at the right time or building industry foresight combined with inside connections, Douglas Barnhart's business decisions have made his name synonymous with educational construction in San Diego County. In the San Diego commercial real estate arena, ECP Commercial has found its home serving the middle ground: the everyday citizen interested in getting into property investment. Paul Brown is constantly on the move as president of the public services group for Camp Dresser and McKee Inc., and as such responsible for the firm's North American public projects. New York, Denver and Cambridge, Mass., are just a few of the cities Brown finds himself in on a regular basis.